The BCS doesn’t release their rankings until a few weeks into the college football season, and this year’s title game is exactly why they are right to do this. Since we don’t have any preseason BCS polls to look at, let’s look at another poll, from the Associated Press, instead. The AP preseason top 25 poll was released before a single play had been run. Their findings were pure speculation. If you want to call them educated guesses, that’s fine, but there was nothing to actually back these guesses up with. Alabama was ranked #2 in the AP preseason poll, which means that the people who vote in the AP polls got Alabama exactly right. They are one of the two best college football teams, and are playing to decide if they’re the best team of all. Hats off to the AP for calling that part. But the supposed experts, to use a football analogy, fumbled the ball badly with the second half of the 1 vs. 2 matchup. Notre Dame, Alabama’s opponent for the football trophy that gets awarded after the game is decided, was nowhere to be found in the preseason AP poll. To be fair, they were the first team left off the list, and a few educated guessers saw some potential in Notre Dame this season. But most of them missed it. A 50% guess rate, which is what the AP had in their preseason poll, isn’t so great. In fact, it’s a great argument for why there shouldn’t be any preseason polls to begin with. It gives people who eat and breathe college football something to argue about back in August, I suppose, but this year’s results show that it’s generally just a waste of time and effort. So hats off to the BCS, which I’m generally not fond of, for having the good sense to hold off until a few games have been played before trying to rank these teams against one another. And the AP’s preseason #1 team? 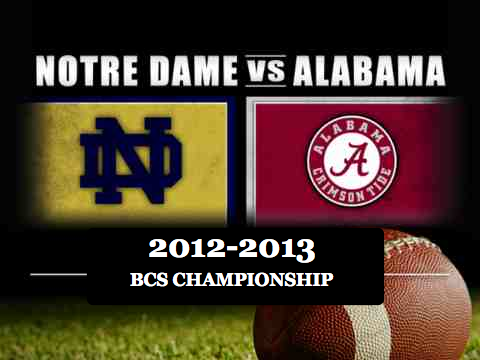 This is probably too sweet for Notre Dame fans, but it was USC. To remove the Trojans from the title game picture, and replace them with the Fighting Irish instead, must feel like quite a victory already for Notre Dame’s fans. But it would pale in comparison to a win on Monday night, which is why they play these games in the first place. On my way home from work today, I filled up the tank of my Prius at a gas station out in the suburbs. The Prius is one way to cope with the gas prices, since a fill-up runs about $25 at the most. With the minivan, it’s usually a lot more than that. A bigger tank is the culprit there. But saving an extra 10 cents a gallon by filling up in the suburbs, as opposed to doing it the city, is a smaller way to cope with high gas prices. Buying gas in Chicago is an extravagance that I usually avoid at all costs (no pun intended). The gas station was empty when I pulled in, and there were 10 pumps available to meet my petroleum needs. I chose one of the pumps in the middle (number 6, I think it was), put the car in park, and stepped outside to get it over with. Laying on the ground was a penny, and I picked it up and looked at the date. 1995 was the date on the coin, and even though I’ve written about that year before, another memory came back to me and I wanted to get it out into this space. That way, I can comfort myself with knowing that I shared a story with whatever part of the internet might care to hear it. In 1995, Northwestern’s football team suddenly became competitive. The 1970s and 1980s were not kind on the football field, and the winless season that coincided with my last year on campus was undoubtedly a low point. But the 1995 season started with a win over Notre Dame, followed by an inexplicable choke against Miami of Ohio which could have–and would have, in any previous year–set the death spiral in motion. But 1995 was different. Gary Barnett’s team came back and won every game they played that year. They won all of their Big Ten games, and, as was the tradition in those days, they advanced to the Rose Bowl on New Year’s Day. Ah, the good old days before the BCS came along and mucked everything up. When the Rose Bowl came around, Northwestern stood at 10-1 and was #3 in the national rankings. They were ahead in the fourth quarter of that game, too, and I had visions, if not of a national championship, then at least of a #2 finish in the polls. But it was not to be, since USC beat the Wildcats and they fell back in the final polls as a result. What a ride it was, though. 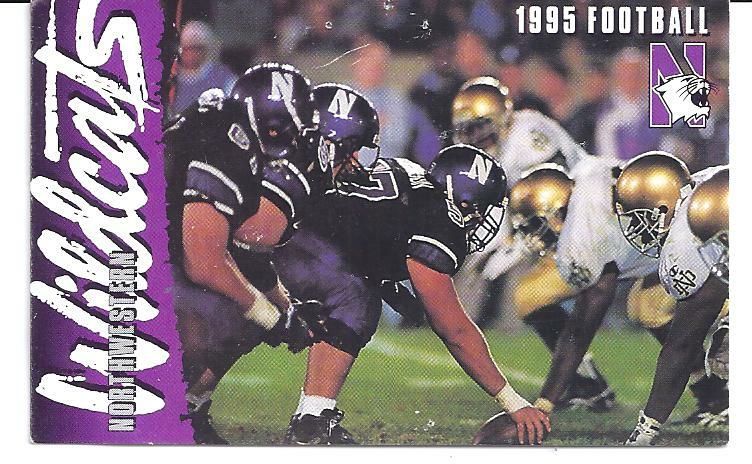 The leader of that team, Pat Fitzgerald, missed playing the Rose Bowl because he broke his leg in an earlier game. But he’s now the head coach of the football team at his alma mater and mine. I’ve often wondered if he’s thought about replicating that season as a coach. I suppose it would only be a surprise if he hadn’t thought about it. The football team stands at 5-1 for the 2012 season, with some big games coming up in the weeks ahead. Hopefully they’ll finish well, and maybe even win a bowl game because the 1995 team, as good as it was, started a rather long bowl losing streak. Going to a bowl game doesn’t get old, but losing in the bowl game is getting a bit tiring. Everything started to change in college football seventeen years ago, and the memory of that year still brings a smile to my face. May it be replaced by an even bigger smile in the years to come.